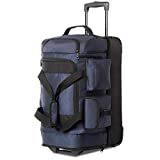 Rolling duffel bags are the preferred ways of moving around your luggage. If you are going for a long trip, the wheels will definitely help you move along, with the least effort and at speed. They do offer good solutions to your storage needs. Your items will be kept safe in place while you are away. Your vacation will be less of hustle when you know your luggage is safe and secure. This is paramount for any of these bags to be on this list. These duffle bags also do offer a good solution for storage of items you do not want to use in the near feature. Therefore, they are good for all around the year. Rolling duffel bags come in varying shapes and sizes. It is important you find the bag that is suitable for your needs. In addition, they do come with different features, such as side pockets to let you access your quick draw items, such as phone chargers. Many options out here in the market do not meet the good standards you require to travel in peace. All the best rolling duffel bags in this review have been handpicked from research and experience of using them. We are 100 % sure, they offer value for money. We start our list with AmazonBasics duffel bag. The manufacturer is known to provide quality at the best prices possible. Here, they do not deviate from this norm. This duffel bag is made of strong, durable materials. Its side and base are made of 1680D ripstop fabric with durable lining. This ripstop fabric is also reinforced, to resist tearing and ripping. On your travels, your bag will hold up well against usual bumps. The top is 100% polyester. On the design aspect of it, it looks beautiful and functional. Warm grey colors combine with black to form nice patterns. This design gives the user a good visual guide to its different compartments. These small pockets let you store or remove small items conveniently. You have the option to use shoulder straps on this bag, making it suitable to use on rough terrain, or if you have few items. The shoulder straps are detachable, for a clean looking bag. The wheels perform well under heavy stresses. You can select one from 35, 30, or 26-inch sizes. The Coolife duffel bag is made of lightweight and strong materials. It does not contain frames like other in the market to help it keep its shape. However, frames add some more weight. This is a good choice for those looking on moving with airplanes. That extra weight of cargo can be put to good use, or save you money. The overall bag weight is fantastic. For what it lacks in shape, it makes up for in space. You can easily surpass the cargo weight requirement with its large capacity value. If you are skeptical of the quality, Coolife offer you a 2-year limited warranty. Imagine that on a bag. It has two large compartments for shoes and clothes. In addition, you get six more outside pockets for quick access items. You can get on the road with its quick release handle. The wheels perform well enough to handle the ordinary terrain. Between the two large compartments, you combine them into one. This will give you a large space to use and store your stuff. You can also use this duffel bag as a carryon bag. Gothamite has made this duffel bag to meet the need of those looking for the big capacity bags. This thing is huge. For the price, you will not get such features. 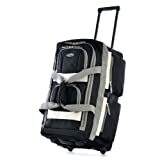 With three rolling wheels, your bag is well suited to carry around your large volume luggage. This is very good for a bag that can carry a lot of items. The fabric is tough and strong; it will not tear easily. Therefore, if you are looking for a large capacity volume bag, this is a good option. It is a little bit heavy on its own, but carrying all that self-weight is no joke. This bag is also ideal for those looking for a camping trip. It can fit in your SUV very well. While at the camp, you can have access to more items than other smaller bags. The best thing is that it is even cheaper than many small bags on the market. The Dakine duffel bag incorporates many nifty design features to give you a hustle free experience. It can fold flat, to just 7.5 inches depth. This will help you save on lots of storage space when not in use. This design is so unique that Dakine even patented it. Inside the bag are large compartments, separated with see-through meshes. This is particularly good for people like athletes that want to separate their items, while on the road. It gives them quick access to their tools of the trade while giving them a safe storage option. The design is crafted to look beautiful and functional. You have the choice of selecting from 18 different color and style combinations on its fabric. The 600D polymer fabric is reinforced for you to get the most out of this bag. Its zipper is made of YKK number 10. This ensures your luggage is kept safely inside the bag at all time. With this bag, Dakine provides a lifetime limited warranty. 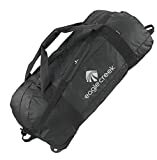 With this rolling duffel bag, Eagle Creek offers what they call a NO MATTER WHAT WARRANTY. What this means is that they will repair your bag, throughout your experience with it. The cause of fault does not matter to them. With that being said, this bag is made of Bi-Tech fabric. This makes it weatherproof and resistant to abrasions. Otherwise, people would constantly be sending their bags for repair, if not for this. This bag is also made with oversized, threaded wheels. This ensures good mobility over the toughest of terrains. With a capacity of 128 litters, this is very huge for most items you may need. It also has carried on handles. You can ask your friend to assist you in carrying the bag in rough terrain. Alternatively, you can carry it on your own if the luggage is light. These handles are detachable, and leave you with a clean looking bag as you roll with it. When not in use, this bag folds very well to save you on space. You can store it in the pouch included. This pouch can also be used to store items that are dirty, inside the bag, separating them from clean items. Olympia’s rolling duffel bag takes the fifth position. Even though it is cheap, the quality is pretty amazing. It is sturdy and carries your items securely. The 1200 D polyester material offers adequate protection for your items. In case your zipper has an issue, simply pull it back, and the excel zippers repair themselves. It has eight carrying pocket. With this, you can gain access to the items you want to swap quickly on the go. A hideaway pulls out handle retracts to let you cruise to your travel destination. The wheels are reinforced, to give you the maximum amount of mileage. The quality is very good for normal everyday travels, the design is fantastic, and it is cheap. At its price range, this is by far the best option in the current market. Olympia makes it yet again on our list with their 22-inch version. First, it is very cheap, when you consider all that is offered. It is super light making it ideal, for travel by aircraft. It is filled with bits of features to help you carry it around easily. Take for example the side carrying handles. If you are on tough terrain, you can use this option to get to your destination. The other smaller pockets let you store your quick access items, such as chargers and the like, conveniently. Each pocket can have a little bit of everything. The fabric used is lightweight, and very easy to clean. In most cases, wiping of stains with a wet cloth works. The wheels are amazing and get the job done. The handle retracts and hides well. You can access the handle, simply using the push button. For its size, this is a great duffel bag for holding by hand. At only 22 inches, it is easy for you to keep your items safe during your adventure. Four extra side pockets offer you the option to store smaller items, for a quick use and storage option. The main compartment has a U shaped design for storing or removing your items. The fabric used is strong, to refrain from cuts and tears, yet light enough for you to have an easy time moving it around. The best part about these duffel bags is their playful fun prints. With the high number of color, you are sure to find the most attractive bag for you. You will be making a bold fashion statement when you are using this bag. This is a good duffle bag, to take with you on your short trips. The Sierra 57018 narrowly misses the top spot. This bag offers top-notch quality and value for money, for anyone. It is jam-packed with features that everyone, will find very crafty. It comes with multiple grab handles for you to move it around in many numbers of ways. This is a good option to have if its reinforced wheels cannot handle the rough terrain well. This duffel bag also expands from the top by about 2 inches. This gives the user some valuable extra real estate to play with when needs be. With its quality materials, this bag is ideal for long periods of travel. The fabric is splash resistant and very easy to wipe. This roomy bag will always handle whatever you throw at it. Top on our list is the Olympia 33-inch duffel bag. It marks many boxes, concerning quality, and what you get. The price of it is very affordable. The fabric used is top notch, easy to clean and holds up well under stresses. The wheels are very strong and reinforced to handle even rougher terrains. The different compartments have been placed conveniently and can be used for many purposes. At its size, this bag is ideal if you want to move with lots of luggage for a long period. It is also surprisingly light, in weight; this also makes it ideal for aircraft travel. Olympia has added a little bit of everything on this bag to provide the ultimate solution. It offers good practical solutions to real-world problems. Everyone will find this bag useful having around. The market for duffel bags constantly changes throughout the years. Some become outdated, and their features are quickly thrown into the nether land. There have been many brand manufacturers that have come and gone. The market is very competitive. Making the right choice for your need can be a problem in most cases. Thus in this list, we have selected the bags that stand the test of time after many years of use. 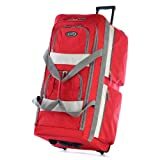 In this list, we have a variety of options from large, medium, and small-sized rolling duffel bags. Remember to ensure you select the size that is best for you.